The reprint of “Prison Chaplaincy Guidelines for Zen Buddhism” from the Engaged Zen Foundation is finally available. This is one of a number of guides for people engaged in prison ministry within the context of Zen Buddhism and contains quite a bit of practical information. 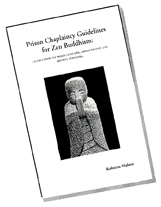 Prison Chaplaincy Guidelines for Zen Buddhism: A Sourcebook for Prison Chaplains, Administrators, and Security Personnel is intended to provide valid information to prisoners, correctional and judicial professionals about the practices of Zen Buddhism in prisons and jails. Zen is one of many schools in the Buddhist traditions; it is not the only one. The information presented here is primarialy about Zen but can serve to illustrate, in a general sense, Buddhist practice in prison. The example of liturgy and descriptions of monastic practices contained herein, however, are representative of a Rinzai Zen Buddhist sect and do not necessarily mirror those of other Buddhist sects. Terms used throughout this book originated in the Sanskrit, Pali, Chinese, and Japanese languages. No attempt has been made to provide in-depth definitions of these terms other than their usage relative to this text. Buddhism is growing at a phenomenal rate in American prisons, and this trend can be expected to continue for the foreseeable future. We trust this book will help to foster the ability of prisoners to engage in contemplative spiritual practice while incarcerated. It had been out of print for a while and Rev. Kobutsu Malone led a successful donation effort to gather the funds for a reprint. He has put a PDF document up with details.